Tavern Kantinon Rovinj is located at Rovinj waterfront, overlooking the old town. Tavern has been there for ages, but it was one of those places that attracts your attention in a weird way. I always wanted to eat at this tavern, because of its Italian canteen style, but smell of frying and very few visitors always scared me away. However, star Croatian chef Tom Gretic, along with sommelier Emil Perdec, is responsible for the new dining concept and a brand new menu at tavern Kantinon Rovinj. All ingredients used are local and fresh. New concept from this innovative chef showcases his personal take on Rovinj cuisine based on town's fishing tradition. The menu brings authentic flavors of Rovinj and Istria. Tavern Kantinon offers cozy and casual atmosphere featuring typical decor of an Istrian tavern with rough plaster stone walls, long wooden tables and benches, huge wine barrels, open kitchen. There are few high tables and stools for a quick bite. Tavern Kantinon doesn't have a terrace for eating outside. There is only one table for four persons outside. Tavern is open daily, except on Mondays, from noon to 10 pm. I've visited the tavern Kantinon Rovinj already three times since the new management took over. And every time I enjoyed delightful seafood accompanied with an excellent local wine. 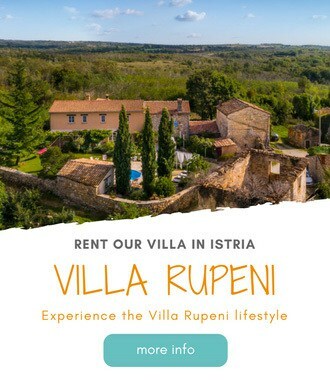 This sprawling restaurant has excellent menu which wraps homespun Istrian eats in a stylish package, an extensive Istrian wine selection to pair with the delicious food, top-notch waiters and fair prices. It is not unusual to make a meal of appetizers at Kantinon Rovinj. I've tasted a number of them during my visits to the tavern. 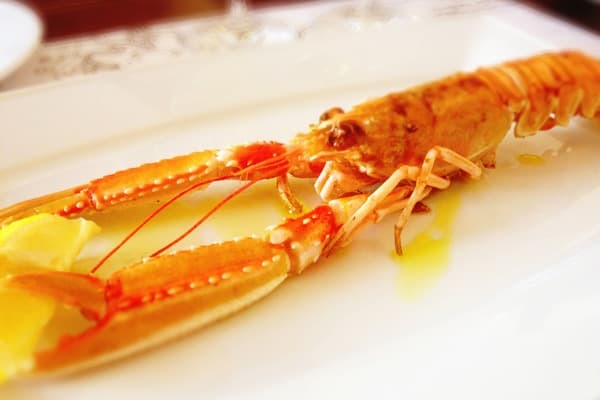 Starters that I've tasted include raw scampi served along with oysters, grilled scampi grilled and sprinkled with olive oil, baked scallops with breadcrumbs, cheese and olive oil. They were served with Persuric sparkling wine. Scampi were sweetly fresh. The meal continued with a plate of barley with squid in a black ink sauce, octopus with green peas and plate of sea shells including mussels, Noah’s Ark, and clams. The dishes were accompanied with a local white wine Malvasia Istrian Sonata, produced by Rovinj's winemaker Dobrovac Wines. On three occasions, I've eaten at the tavern Kantinon, main dishes included Common Dentex fish served with clams and Istrian sausage, and a frog-fish with cornmeal, apples and sausage. Dessert included Dalmatian rozata, Dalmatian custard similar to flan, and pandispanj, traditional sponge cake, typical for the coastal regions of Croatia. Tavern Kantinon is an excellent addition to already exciting Rovinj restaurant scene. It is a place well worth a visit. A place that strives to safeguard traditional cuisine, fresh, seasonal, authentic flavors of locally grown produce. Well done! I went to Knatinon three times after I had written this post. The last time I went, the food wasn't that good and the service was lousy. I also checked the Tripadvisor reviews, and it really seems that Kantinon is somehow inconsistent in food and service quality. Such a shame, since the place is really charming. Hopefully it is just a temporary thing. Have you been in the tavern Kantinon? How was your experience there? Let us know in the comments below. We ate here twice recently. The food combinations are unusual and the food well cooked. Loved the fig cheesecake & had it twice! Also liked the atmosphere of the place. Glad you have enjoyed it, Hazel! We ate here a few days ago and we’re very impressed. Awesome atmosphere, great food, and reasonable prices. And you do have the option to eat outside though we chose to sit inside to enjoy the atmosphere. I ate at Kantinon last night and found the service very poor and food inconsistent. I had an excellent fish soup but very average Orzo with seafood, my partner had octopus stew which she said was very average and over salted but a nice fish grilled. Wine was good and big selection, I will probably not go back again this week, maybe next year. I noticed Kantinon yesterday and I really like the look of it. I did not eat there because I already had a dinner, but will definitely give it a try. I am in Rovinj this month. How about having a drink together? Beautifu town and restaurant, amazing food!